Regular readers of this blog have probably noticed that I haven’t posted much lately. There is a good reason for that: I’ve been busy getting my book ready for print. I got the proof copy in the mail yesterday. After working on this project for more than a year, it feels great to finally hold the result! The book will be out next week, once the final corrections are done. 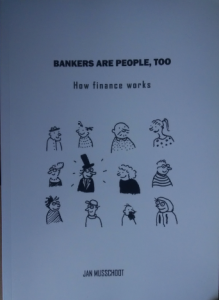 Bankers are people, too is an introduction to finance for the general public. In about 200 pages, I give a big picture overview of banking and money. 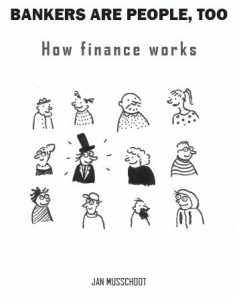 The book explains how commercial banks create money, what central banks do, the distinction between banks and insurers, how quantitative easing works, the interaction between finance and the economy, and much more. The topics in Bankers are people, too are not exactly bedtime reading material. That’s why the text is interspaced with cartoons. The ideas in the book are illustrated with plenty of examples and figures. As soon as the book is out, I’ll have more to say on its content and why I picked this title. Does having to sell my book mean that this blog is going to devolve into a series of ads for it? Well, no. I have a huge backlog of ideas for posts. Including one on blockchain/bitcoin, an assessment of QE, some reviews of books I’ve read, and how I (sort of) became an economist. Author JanMusschootPosted on September 13, 2017 September 22, 2017 Categories EnglishTags Bankers are people tooLeave a comment on Book news!